E-Ride Nights are an exclusive "private party" in the Magic Kingdom for a limited number of Walt Disney World Resort Guests with Multi-Day Passes. Please note: E-Ride Nights have not been offered since August, 2004. The Extra Magic Hours program was introduced in January, 2005. More details here. Historical E-Ride Night dates can be found here. 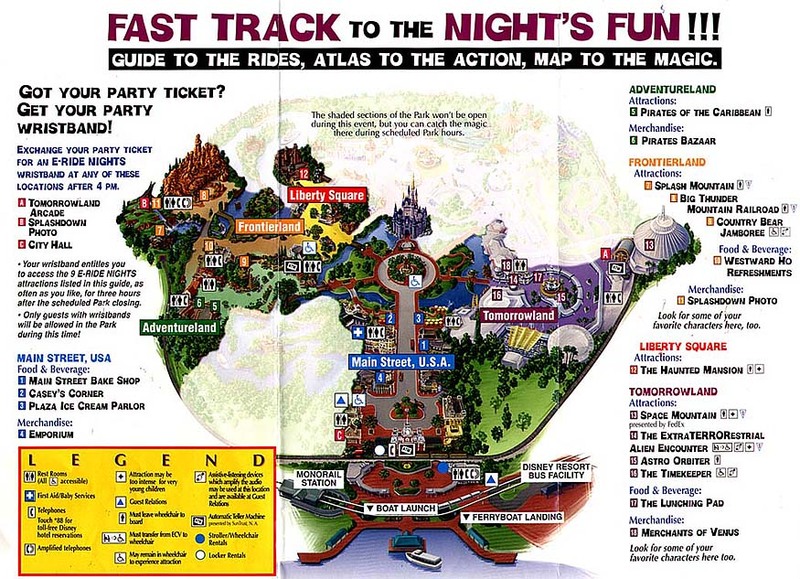 During an E-Ride Night, some of the most popular attractions are open to ride as often as you like including Space Mountain, Splash Mountain, Big Thunder Mountain Railroad, Buzz Lightyear's Space Ranger Spin, The Haunted Mansion, The Many Adventures of Winnie the Pooh, Mickey's PhilharMagic & Peter Pan's Flight. Of course, selected gift shops and food/beverage establishments are open as well. What you do.... Purchase a ticket at Guest Services at your resort. Exchange your ticket for a E-Nights wristband at any of the following Magic Kingdom locations any time after 4pm on the day of the E-Ride Night: City Hall, Tomorrowland Arcade and Splashdown Photo. The E-Ride Night runs for 3 hours after scheduled closing of the Magic Kingdom. Only guests with E-Ride Night wrist bands will be allowed in the park at this time. Tickets are available at the Guest Services Desk at any Disney Resort on a first-come, first-served basis. You MUST show Disney Resort ID and Multi-Day ticket (Length of Stay, All-In-One Hopper, Park-Hopper, Seasonal Pass, Annual Pass and Premium Annual) at time of purchase. Disney says that tickets are limited and it is advisable to purchase early. Tickets to the E-Ride Night must be used in conjunction with a same day Multi-Day Ticket admission to any Disney Theme Park. Disney Resort Guests, Hotel Plaza Blvd. Guests, Swan, Dolphin and Shades of Green Guests with multi-day passes are eligible to purchase E-Ride Night tickets. PLEASE NOTE: INTERCOT does not guarantee that these prices are accurate as the Walt Disney Company may change prices as they deem appropriate. The list is provided here for your convenience only. Ticket types, entitlements, and prices subject to change without notice.